SILVER FINISH ON ONE SIDE FOR EXTRA UV PROTECTION, SUN REFLECTION AND HEAT REDUCTION. 50 MICRON THICK UV RESISTANT LDPE LAMINATION BOTH SIDES. CONSTRUCTION: Silver on one side, black on the other, 4.8 oz. per sq. 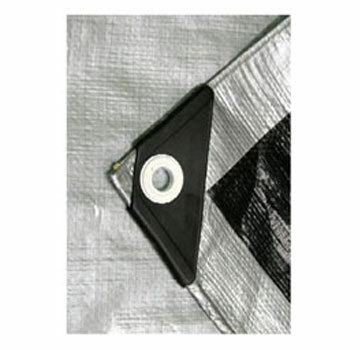 yard, highly ultra-violet resistant treated reinforcing yarns, black woven scrim, heat-sealed seams for total water-proofed tarp, reinforced hems and rust proof grommets. OPTIONS: Other sizes from 6x8 to 60x60. 1/4 inch x 300 Foot 3-Strand Twisted Monofilament Yellow Polypropylene Rope, UV Stabilised, 1250 lb. Break Strength. Price/Each.